A parking lot is something that we all use on a regular basis that, over time they begin to wear and tear. The constant weight of vehicles moving back and forth across the asphalt surface can begin to crack and deteriorate leaving you with an unappealing and potentially dangerous parking lot. Not only does this reflect poorly on any given business or public space, but it puts people’s safety at risk! 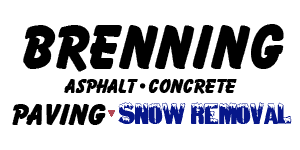 At Brenning Paving and Construction, we offer reliable and effective parking lot paving and repairs to play our part in installing high-quality asphalt surfaces across town. We work diligently with local business owners and government bodies to improve parking lots for those who use them daily! From filling in potholes and cracks to re-leveling the surface altogether, our expertise in parking lot sealing is evident in all the work we do. We strive to help add many more years of life to the parking lot itself. First impressions are important, so having a nice, clean parking lot for your business can go a long way. Parking lots that are worn and/or damaged become quite difficult to spend time in. It can take longer to get out of your spot, and can even make the art of parking much more difficult and hazardous than it needs to be. We can put in place an elaborate parking lot paving solution for repairing the damage done and optimizing the look and quality of your property overall. We have the competence and the knowledge to handle even the most challenging of parking lot paving issues. So, contact us today and we can help you arrange parking lot repairs as and when you need them. We make use of intelligent parking lot seal coating to help lock in the quality and to ensure that the elements stop having such a detrimental aggregate effect on your paving. We offer both professional new parking lot construction and repairs, so no matter your needs if you are looking for a service that can deliver a high-quality product and easy parking experience to your property, let us know!